The first day visit of 2019 took place on an unseasonably mild Thursday in February. On arrival at Tate Britain we disgorged from the coach to be met by Luke, the Tours Coordinator, who guided us to the Clore Auditorium for a fascinating illustrated lecture by Peter Scott. Burne-Jones never attended art school, but after schooldays spent in Birmingham, went up to Oxford and there met William Morris. 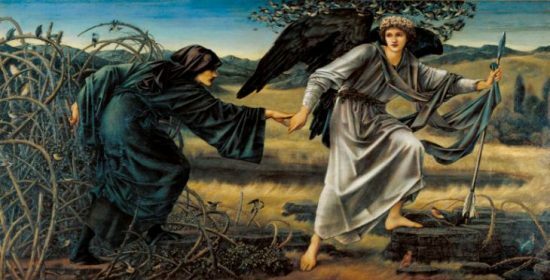 Although, in the lecturer’s view, he was too young to be considered a true pre-Raphaelite, Burne-Jones’ was to lead the movement into new symbolist directions. 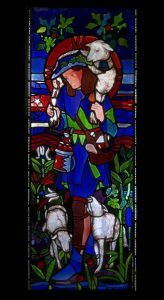 Nor was Burne-Jones solely a producer of fine art, being equally at home in the creative arts, designing stained glass, embroidery, tapestry, furniture and jewellery. Drawing was the basis of Burne-Jones’ craft and the exhibition included some beautiful examples of his detailed pencil studies, produced when preparing for his larger works. There were also examples of his comic drawings, included in a letter to a grandchild or to amuse a friend, in which he treated himself as the object of a joke. Peter Scott encouraged us to look for the artist’s exquisite rendition of birds and flowers in both his watercolours and oil paintings. In Leading the Pilgrim there are several individual birds around the feet of the angel and the pilgrim, as well as a flock of birds over the head of the angel. We were also invited to examine some of the ways in which Burne-Jones brought his own unique approach to a scene, including the small fire in the nativity scene in a triptych painted for a Brighton church. Burne-Jones’ portraiture was also unconventional, capturing the inner feelings of family and friends with the minimum of props and accessories and avoiding society commissions. After enjoying Burne-Jones’ large scale and dramatic narrative cycles: Perseus and The Briar Rose, the exhibition’s final room revealed a breathtaking tapestry of the Nativity. With its fresh and vibrant colours and flowers redolent of a country garden, the work provided an uplifting finale to an exhibition which for many, exceeded our expectations.